← Canada’s Own Skateboarding Bulldog! Pearl Gossett was a nurse at a coal mining camp in Blocton, Alabama in October 1912. While cooking a meal for a patient, she suffered a terrible accident. The gasoline stove she was using exploded in flames. The burning gasoline covered her left arm, breast and shoulder, inflicting severe burns. Remember, that this was a time without antibiotics and such injuries were life-threating. Carlo Bianchi worked occasionally as a nurse in the camp. This led him to know the medical staff. He was on friendly terms with one of the staff doctors, Dr. Thomas. A few days after Gossett’s accident, Dr. Thomas stopped by to share a beer with Bianchi. The conversation turned to Gossett’s condition. Not sugar coating the situation, Dr. Thomas said that her condition was very serious. He further added that her situation was growing more dangerous because gangrene was setting in. Asked if anything could be done to help Gossett, Dr. Thomas said skin grafts might save her. Unfortunately, Dr. Thomas had been unable to find even one person willing to donate even a small square of skin for the procedure. Even though Bianchi didn’t know Gossett well, he knew that she had a reputation of being a compassionate, caring person. Learning that she might die, or at least lose her arm, because of the unwillingness of others to help, angered Bianchi. Asking how many inches of skin would be needed, he learned that perhaps forty to fifty inches would suffice. He volunteered on the spot. That night, a team of doctors removed seventy-two square inches of skin from Bianchi’s thigh. After the procedure, Bianchi’s leg was bandaged from knee to hip and he spent weeks in the hospital recovering. As he was about to be released, Dr. Thomas visited and stated that Gossett needed more skin grafts. Again, Bianchi volunteered and had 50 square inches removed from his back. Battling pain and pleurisy, he would spend the next three months recovering. Broad white patches of scar tissue marked Bianchi’s back and thigh for the remainder of his life. A reminder that his sacrifice had saved the life of Pearl Gossett. You may think that this is simply an interesting story of altruism. However, the story takes on even more meaning when I tell you that Carlos Bianchi was an alias. 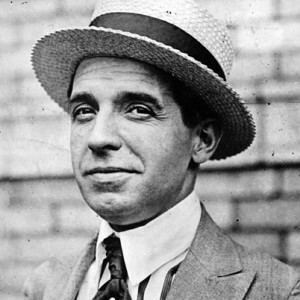 Bianchi’s real name was Carlos Ponzi, which was later Anglicized to Charles Ponzi. The man who gave the skin off his back to save a critically-injured nurse would, eight years later, become infamous for his get-rich-scheme. Unfamiliar with a Ponzi Scheme? It is a fraudulent investment that pays returns to investors from their own money or the money paid by subsequent investors, instead of from profits earned from the operation. It is also known as robbing Peter to pay Paul. This post is adapted from a story published in Ponzi’s Scheme: The True Story of a Financial Legend by Mitchell Zuckoff. This is a fascinating, entertaining and highly readable book about Charles Ponzi, his life and his scheme. I highly recommend it!